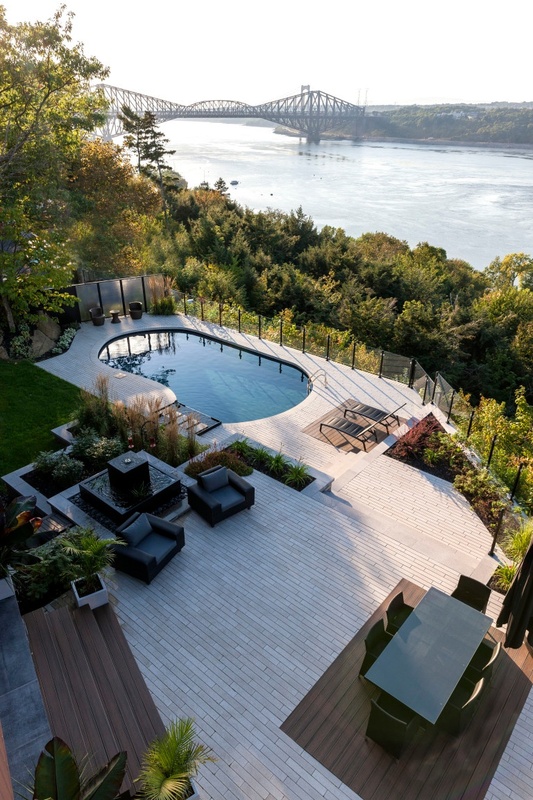 This contemporary project was designed and installed by Desrosiers Landscaping in Lévis, Québec. It took three men a total of 1500 man-hours to complete the 2500 sq. ft. job. Overlooking the Saint-Lawrence River and on the opposite bank of historical Québec City, the yard boasted a spectacular backdrop. Understandably, the homeowners wished to create a private oasis that would highlight this panoramic view. They also wanted a contemporary and versatile space that felt coherent and intuitive. 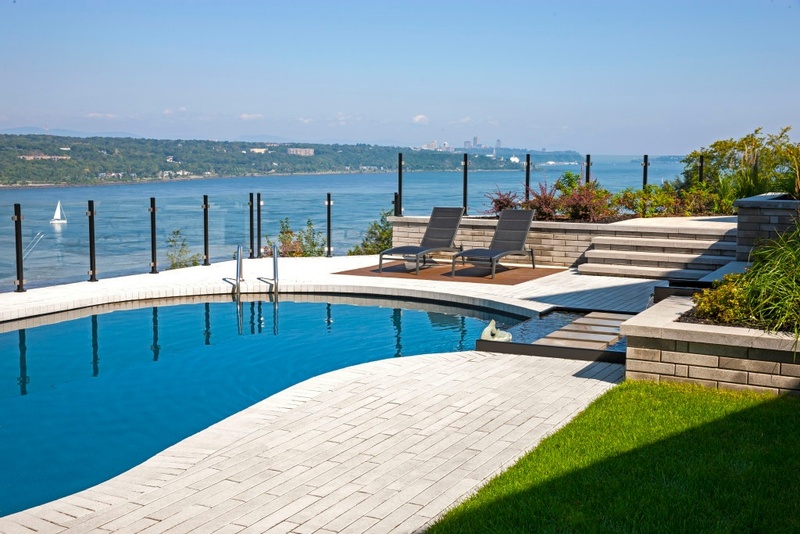 They chose Techo-Bloc for their modern product line and created surfaces and platforms that would be both effective and functional solutions to the various challenges present on site. The terrain itself posed certain problems. The property was located on a cliff and the team had to pay particular attention to grading. The site was also set on bedrock; meaning excavation requirements and preparation time were unpredictable and potentially problematic. In terms of slope, an existing pool sat six feet below the back patio door and the two levels needed to meet in a way that didn’t feel forced. Additionally, marrying the existing kidney shape of the pool with the ultra-modern style of the home was a challenge. On any given project, the presence of solid bedrock (ideally confirmed through core sampling) will change the approach. While bedrock is typically not susceptible to frost heave and secondary compaction, a manually prepared base is. In other words, solid rock will not move while most aggregates shift over time, resulting in differential settling. One tactic is to pour a concrete slab as a base to ensure a seamless transition and cohesive foundation. Others choose to prepare a base with extra care, create a pitch, and even waterproof the surface to ensure water dispersal. In this case, the team opted for the second approach as no one surface was deemed problematic. They took precautions with regards to depth, compaction consistency, water drainage, and runoff management. The project had to be constructed in precisely planned tiers in order to unite the lowest and the highest points perfectly. Raffinato walls in Greyed Nickel were used to build up certain areas and provide the structure required to retain the soil where needed. These smooth, double-sided, walls were easy to work with and provided an aesthetic means to bridge the gap between the levels. The highest point – a large multifunctional space – was embellished with a fountain: a tiered contemporary structure, echoing the design itself. Raffinato planters were constructed in layers next to this platform, softening the visual impact of the walls used to build it. Raffinato caps were used to frame and finish off the sleek installation. 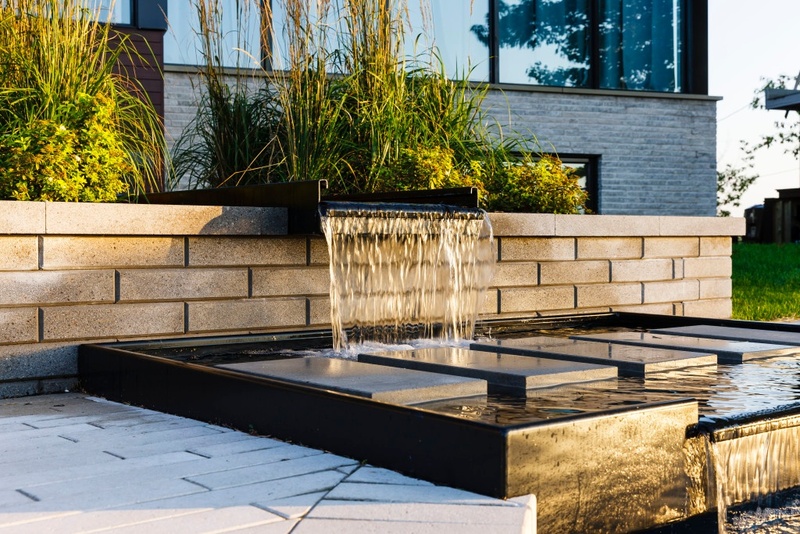 Techo-Bloc’s Industria collection was used throughout the project; available in several dimensions, this product allowed for design flexibility. The patios themselves were clad with 600 mm x 100 mm Industria pavers in Greyed Nickel, underscoring the modern, monochromatic, look that they were going for. In terms of integrating the curvilinear pool with the rest of the clean-cut and contemporary design, a clever strategy of overlapping elements was used. A modern basin was installed adjacent to the pool, spilling into in gently. The interaction between the two water features tied them together, making it look as though the pool and the basin were installed at the same time. 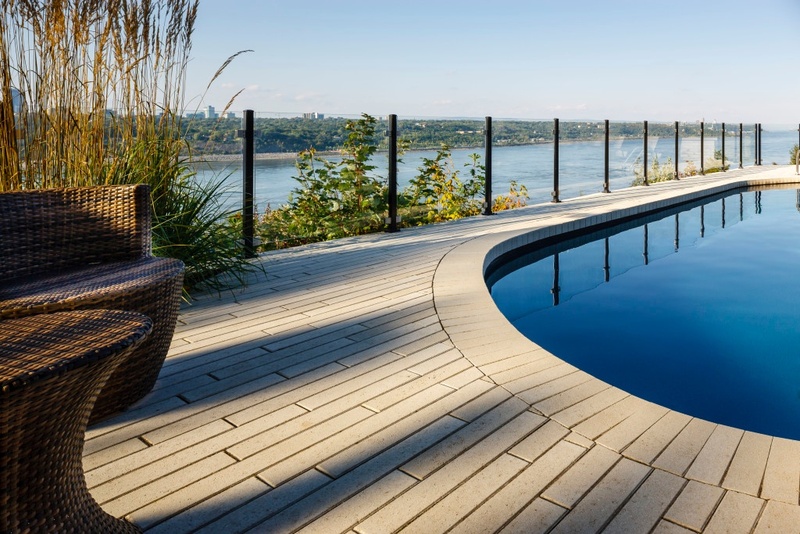 In order to further tie the home to the landscape, sections of the paved patio were inlaid with composite decking that matched the home’s cladding. 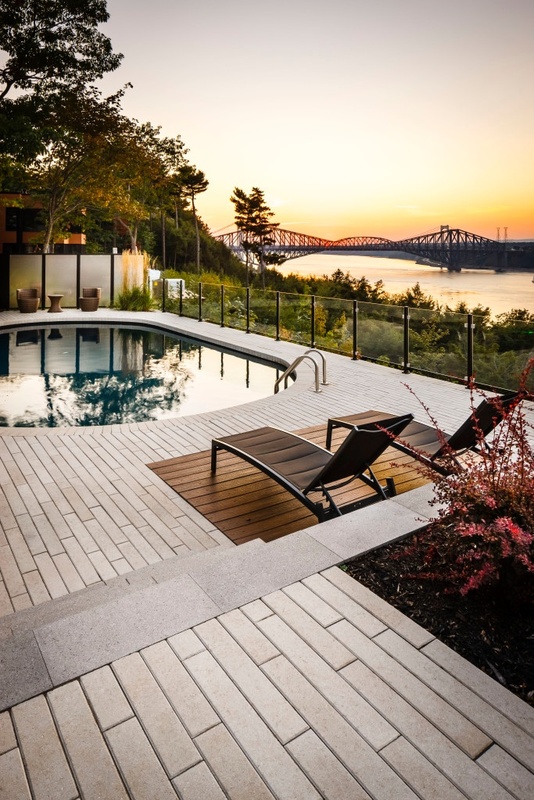 It is worth noting that the homeowners later had the contractors remove the composite decking, only to be replaced with Techo-Bloc’s Borealis slabs. These slabs look identical to real wood but require no maintenance and are a longer lasting alternative. The natural slope of the yard, the creation of tiered patios, and the use of glass, all served to accentuate the breathtaking view. To add intimacy, frosted glass panels, existing shrubs, and mature trees were used to cocoon the yard from the neighbor’s view. Desrosiers Landscaping created a functional space with distinct areas in a style that suited the home and the homeowners. They were not afraid of committing to a look nor were they hesitant to use a product to its maximum potential. 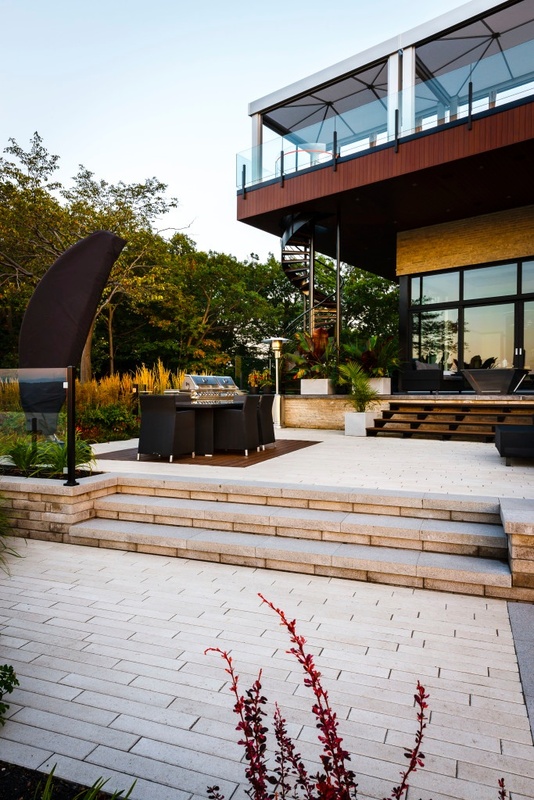 Their technical approach and extreme precision resulted in a striking project that is modernscaping at its finest.